In spite of increasing deployment of technologies over the last few years, the Indian online e-commerce industry continues to face trouble on multiple metrics of supply chain health. For example, ~10-12% of all shipped items fail to reach the end customer, first attempt delivery strike rate remains a dismal 75% and last mile costs as a part of overall logistics costs are a high 45-50%, compared to 25-30% in more developed economies. Not only do these challenges impact the customer experience, they have a major impact on the bottom-line of these already bleeding firms, with logistics costs adding up to more than 15-20% of their total cost outgo. The problem only gets compounded further during peak periods e.g. the October festive season, when the shipment count typically goes up 2-3x compared to steady state. Right from its initial days in India in 2014, Amazon has been experimenting with various supply chain initiatives to improve last mile performance and reduce cost, while delivering consumer convenience in the process. One of the key initiatives that emerged from these experiments was a pilot program of partnerships with Bharat Petroleum outlets, where Amazon customers could pick-up their ordered goods from the petrol pump locations. Over time, strong customer response saw this pilot program morph into a pan-India network of 9,000 strong kirana stores, which not only facilitate package pick-ups by customers, but also engage in delivering packages to customers at their doorsteps and processing customer returns. And thus the ‘I Have Space’ program was born. 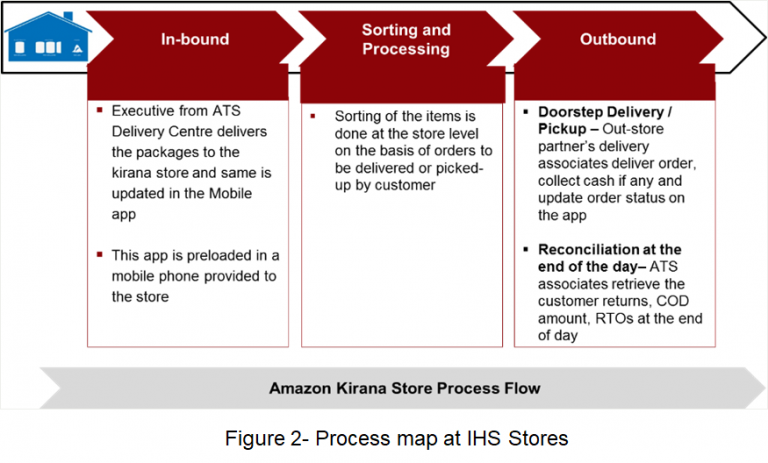 The Process – As the infographic below shows, IHS associated kirana stores act as extended arms of Amazon’s captive logistics company ATS (Amazon Transportation Services). Packages are delivered by ATS staff to the kirana stores, post which the kirana stores take care of the item sorting, delivery/pick-up and order reconciliation. The stores not only offer their staff for deliveries, they also enable Amazon to augment its last mile storage space at locations close to the customer. Each ATS delivery center is linked to 30-35 kirana stores, which enables a 4,000 sq-ft delivery center (for example) to augment its storage capacity by 20-25% by using the store’s storage facilities. 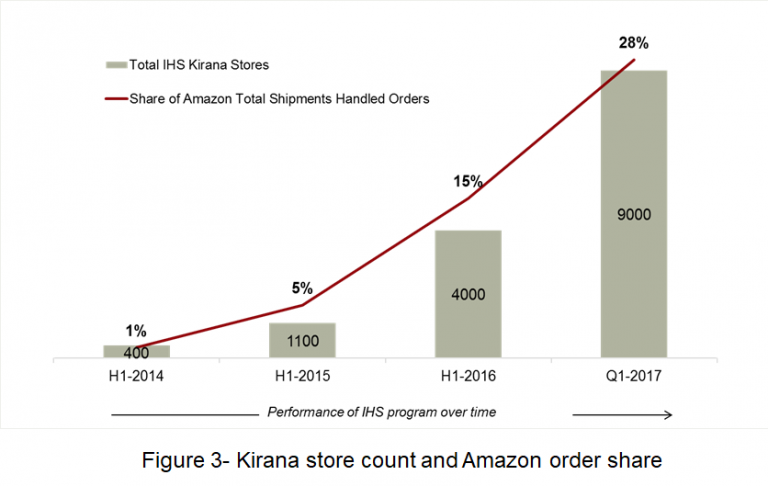 Financials– Amazon pays its kirana stores based on number of pick-ups processed and number of delivery attempts made (INR 20-25 per delivery attempt in mid-2016), along with offering a fixed minimum guarantee of INR 2000-8000 per month, depending on the store. An average store can easily earn an additional revenue of more than INR 25,000 per month by associating with IHS program. The success of the Amazon IHS program can be judged from the fact that the store count has grown from scratch to 9,000 (as of March 2017) in three years flat, with a more than 2x growth in store count over the last one year itself. ~28% of all Amazon deliveries are processed through these kirana stores today. Kirana Store Impact- RedSeer research with kirana store owners1 indicates that they are highly positive about the program and strong growth in shipments processed through the program means that they remain committed to it. The program enables them to monetize their surplus manpower and storage space, thus enabling them to augment their revenues in a significant way each month. 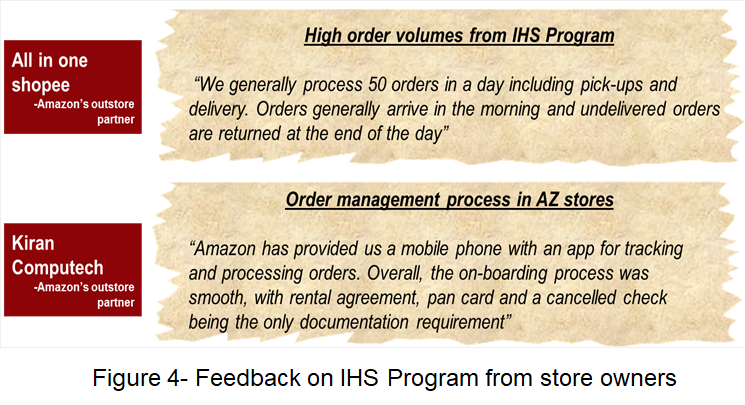 Amazon’s success with the IHS program motivated competitors, notably Flipkart, to launch a similar service last year. While not yet at the scale of Amazon, the service is also gaining traction and should see further expansion going forward. 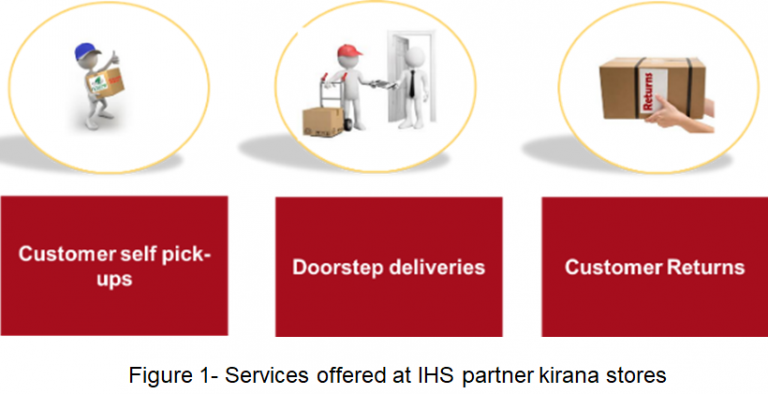 Given the all-round benefits that the kirana store program delivers for stakeholders, we expect that over the next few years, deliveries using such alternative channels would account for 40-50% of all internet e-commerce shipments. With the e-tailing industry poised to expand atleast 4x in shipment terms by 2020 (RedSeer forecasts), this would lead to a manifold increase in the scale of such programs in the future, making possible a supply chain that is cost efficient and high performing and which delivers both customer and kirana store partner delight. 2. RedSeer’s Indian E-tailing Leadership IndexTM tracks the performance of e-tailers on 30+ key customer experience parameters, based on 9000 customer surveys done across 30 cities (Metro Tier-I and Tier-II) on a quarterly basis.